Kitchen trends will continue to showcase some of the changes we saw last year while branching off in pursuit of a more ‘unified’ design. This will result in the lines between living spaces, such as the dining room and kitchen, becoming more blurred. Design trends tend to swing like a pendulum in opposition to established norms, so there is now an accelerating trend towards designs that promote the kitchen as the social hub of the home. Simplicity in design will continue to dominate kitchen trends in 2018, with the ‘borrowing’ of space central to this idea. Cross-purpose features, such as dining tables that are integrated into the kitchen island, will increase in popularity as the idea of interaction within the kitchen continues to gain popularity. 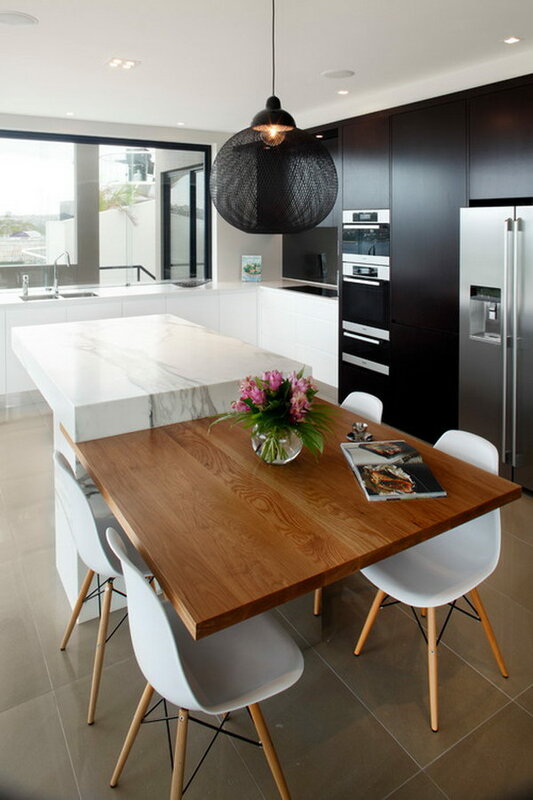 Also expect to see larger and more strategic benchtop space, especially around the sink, fridge and stove. Where does this idea of blurring the lines come from? The delineation of rooms within the home, alongside technology’s influence on how we socialise within the family unit, has created a backlash that has taken on the form of simpler kitchen layouts. Larger kitchen islands and workspaces, coupled with a considered approach to the idea of ‘flow’ in and around the kitchen will feature in 2018 kitchen designs. A growing trend expected to continue in 2018 is bench seating adjacent to the kitchen. This is again a reflection of the desire to merge living spaces while softening the kitchen’s design and encouraging family interaction. 2017 saw darker colour palettes take over many new builds and renovations – especially the use of charcoal, black, greens, blues and clear colour blocking. 2018 will continue to see these kitchen trends continue, especially the use of colour blocking, monochrome palettes and analogous colour schemes. What will be different this year is that there will be a firmer foot on the accelerator pedal, with bolder uses of these brooding palettes, more juxtaposition between two colours and a liberation of textures. 2017 saw plenty of copper, offset with navy and darker colours. Copper is expected to give way as a dominating feature in 2018, with more interplay of textures, tiling, and patterns showcasing the individuality of each kitchen. This liberation comes as a rejection of previous trends but will continue to be supported by clean design lines, open layouts and simple and dark colour blocking. Expect more use of matte either as a surface texture or in fixtures. Matte continues to gain popularity as it can either be supported as a feature by lighter colours, or it can be integrated into a more uniform and understated design with darker palettes. 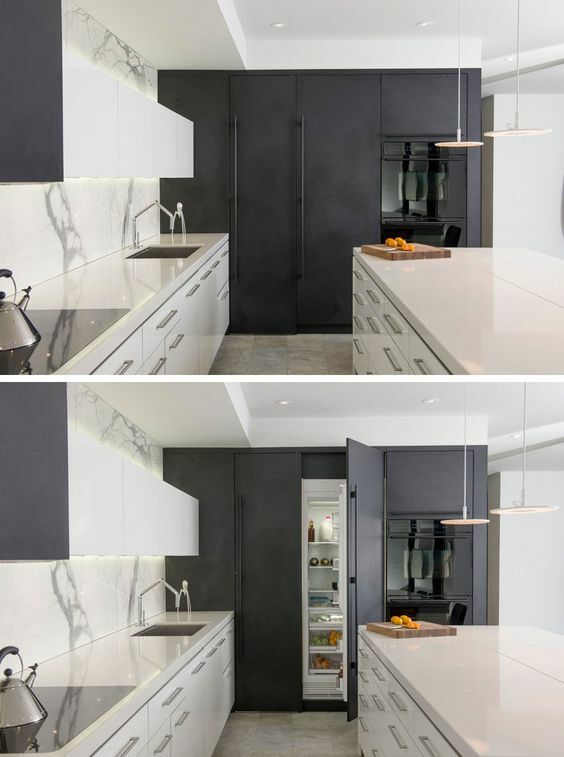 A simplification of sightlines, usability and layout will continue to drive kitchen trends in 2018, so expect to see more appliances such as fridges and dishwashers housed within cabinetry, as well as deeper drawers for added storage. 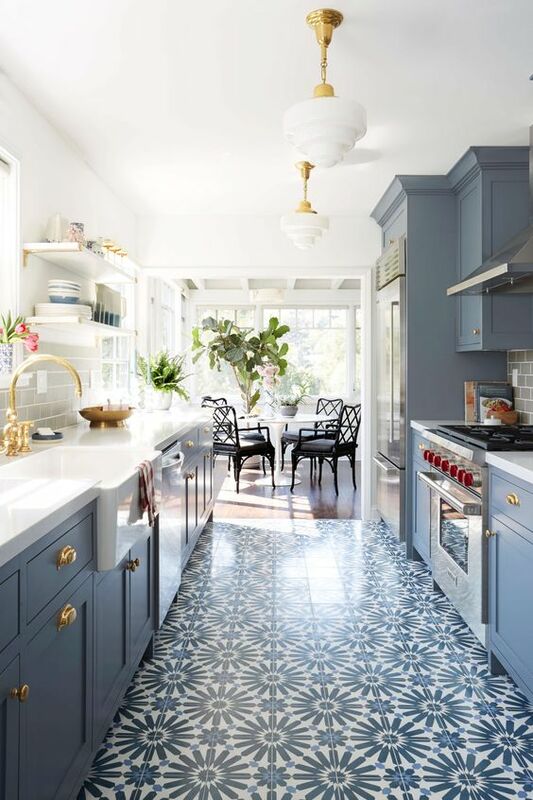 This has been a growing trend that shows no signs of slowing, as it reflects stronger and unified kitchen designs that push for a unification of living areas. Expect to see more accessories that come in a variety of tones and textures to suit the colour palette and blend in more seamlessly with kitchen designs. 2018 heralds the dawn (or return) of more personality in kitchen splashbacks. Glass splashbacks began to be replaced last year with traditional tiling. A bolder use of colours, such as deep reds, alongside traditional patterns and textures, are being increasingly used effectively against modern kitchen design as a feature and colour block. There will also be a strong emphasis placed on innovative solutions within the home, such as touch sensitive or motion-sensitive faucets and the integration of appliances and lighting with your phone.